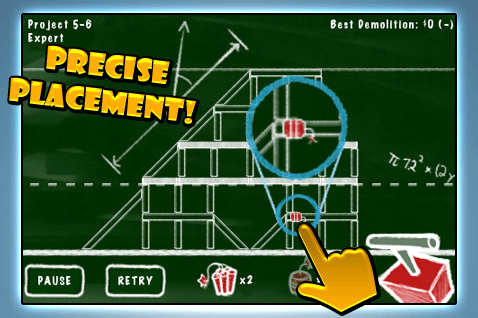 Implode by IUGO Mobile Entertainment is a Apple iPhone game which puts you in the explosion seat and lets blow up structures with the aid of dynamite and powder kegs. There is a total of 80 levels, 10 of which are Christmas themes (blow up a Christmas Tree style structure). Implode is great and will keep you busy, thinking and pulling your hair out for hours on end. If you love BLOWING up things then this game is perfect for you. You can’t get any better than Implode when it comes to its building demolition style physics engine. Structures fall and collapse the way they should. If your a structural engineer the later levels will even have you puzzled and will push to your limits. 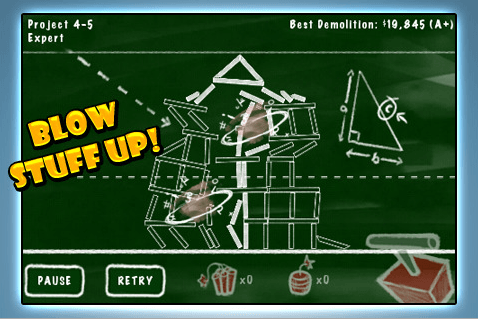 But don’t worry Implode has 3 levels of difficulty so everyone can get stuck into exploding things. Capsule Computers gives Implode a 7.5 Caspule out of 10. Lets us know what you thought of the review and also what you think of the game.